Greetings citizens of the Galactic Republic, I have come before you today with a great tragedy that has yet to come. Jedi spies have indicated that the Sith, ruthless killing machines who wield the force for all the wrong reasons, have returned to the Galaxy. Though it is the way of the Jedi to not act out in violence, I have personally given orders to numerous Republic War Factories to begin assembling a droid army in order to keep peace in the Galaxy. It is in my best interest as the Grandmaster of the Jedi and a citizen of this thriving republic to keep peace throughout the Galaxy. For now my friends, that is all. Basically the Sith have begin building forces, so I will also do the same. These droids I am creating are simmilar to General Grievous' Magna droids. They will be built in various locations. Their properties and attributes go as followed. 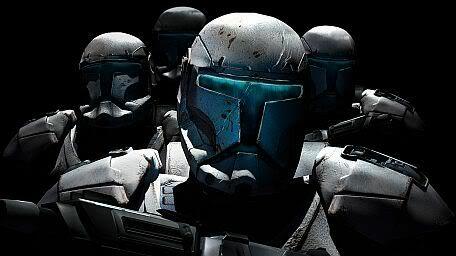 + Armour made of a Cortosis and Mandalorian Iron polymix. + Equipped with Taozin Cloaking, makeing them invulnerable to the Force. + Equipped with an Electrostaff made of Lightsaber resistant Phirk alloy, Electric energy flowing from either side of the staff which can kill targets upon impact and disable ray shields. + Neuro Poison tipped darts ejected from wrist launchers killed upon impact, shutting down all organs in the body. + Combat shield on wrist which dissipates blaster energy on impact and recoils melee damage. Remaining - Aboard Republic fleet. Taozin cloaking, Makes them invisible to the force, But they can be sensed by someone with a high level of training in the force. No, a taozin is a creature whose shell is resistant to the force, meaning a dead taozin could be skinned to make the cloaks for the droid. And no, they can't be senced through the force because they are droids, meaning they have no life energy, meaning they have no force energy. And if they are spotted, the force can't be used within a certain raidus of the taozin cloak. Yeah I misread, It's what I get for not being around in awhile and not paying a huge amount of attension when I looked it up, but they're an anomaly in the force and can be sensed as such, Darth maul's reference to them is proof of that, However only a high level force user would be able to detect them.